Monitors had come a long way from a time when a 1080p product was considered to be on the top tier. The market now further complicates as manufacturers race to produce the best of the best. 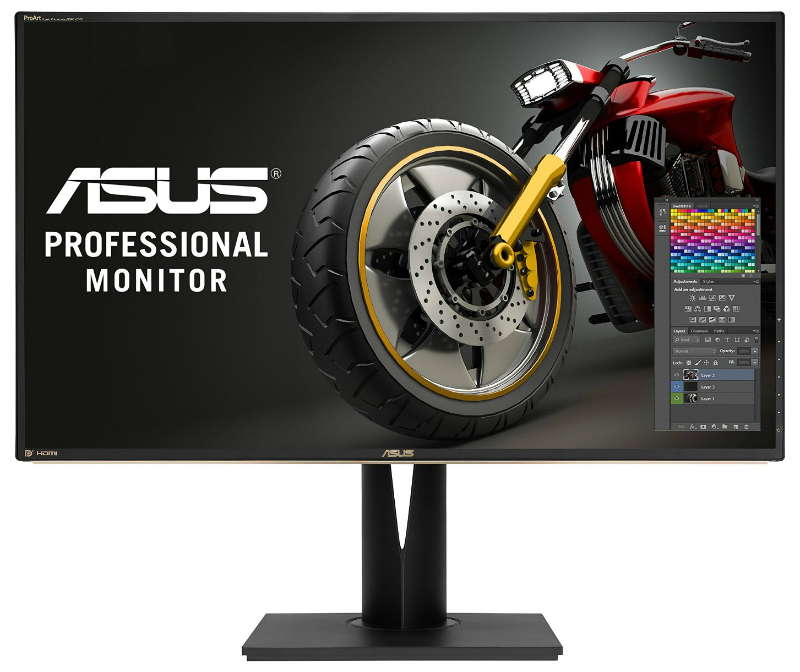 There are the usual inexpensive 60hz 1080p monitors, and then there are the high-end ones that split into two different segments; the gaming and the professional market. Asus is apparently determined to dominate both markets in the high-end market. The gaming products compete to have all sorts of new specifications such as faster refresh speeds, G-sync, and aggressive styling. On the other hand, the professional segment mostly requires only two things, clarity and color accuracy. The Asus ProArt PA329Q is one of their leading contenders in this concept. While not having gaming grade features, the ProArt PA329Q aims to impress by having a wide-gamut capability, Quantum dot technology for outstanding clarity and consistency, and a broad range of calibration coupled with a 14-bit lookup table. The specifications look impressive, so let’s go check it out. The Asus ProArt PA329Q’s cabinet is in a matte black finish with a 10mm bezel surrounding the screen. A gold strip decorates the bottom part to give it a premium look that identifies it as a part of the ProArt series. Overall, the product looks sophisticated and is set to match the professional environment where it belongs. The OSD buttons are on the lower right-hand side corner. To some, this may seem inconvenient, but they have labeled it with printing the bezel. Pressing them also shows a visible logo on the screen. An excellent joystick for convenient navigation of the OSD is also available next to the row of these buttons. The back of the monitor is perforated with a lot of ventilation holes to keep its innards cool. The monitor’s power supply is inside this cabinet, so this design feature is essential to prevent overheating. It may seem as if this is overkill, but in electronics, too much consideration to cooling is never an oversight. Most of the connection options are tucked neatly under the frame except for three USB ports and the memory card reader placed conveniently at the left-hand side of the bezel. The rear frame also holds two 3 watt amplified speakers considered to be decent compared to what other monitors have. A bold Asus logo is clearly visible on to this back panel. As expected with high-end monitors, a plethora of connections are available for the discerning professional. 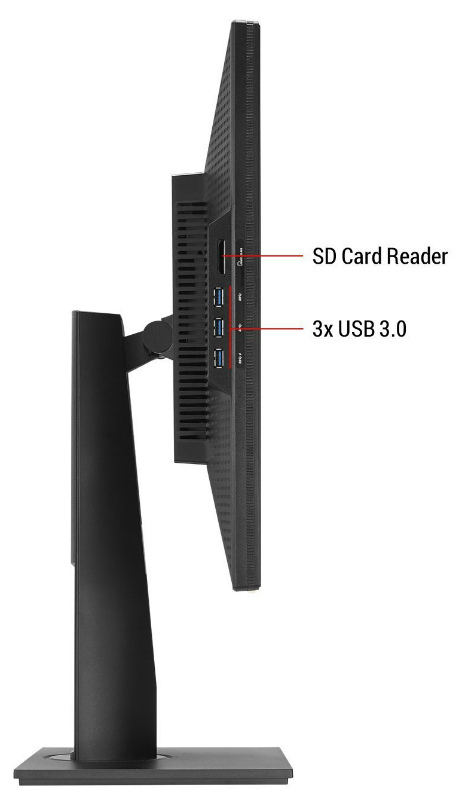 Included are four HDMI 2.0 ports, a DisplayPort, Mini DisplayPort, 5 3.0 USB ports, a USB 3.0 upstream port, standard 3.5mm audio jack, and a Memory card reader. The many USB ports and the memory card reader are a very welcome addition to the whole package. Having the option to attach a multitude of peripherals is convenient for the user who would rather be busy with designs or video editing. Along with this, Asus also included the cables for the ports and its power cord. There is also a cable tie included for them. A cd containing the user manual and calibration application is also in the package along with information prints containing settings of the factory calibration of the Adobe RGB and s RGB preset. The stand and base are of a minimalist yet functional design. Construction is solid and adjustments are flexible. The screen can rise, tilt, swivel and pivot with ease to find the best position to view the monitor. There is a triangular slot in the neck of the stand for the cables to pass through for better cable management. This mechanism detaches via a quick release button from the cabinet to reveal the VESA holes if the user desires to mount the PA329Q. The Asus ProArt PA329Q comes packaged with bells and whistles found only on some of the most expensive products, but its power and price tag are mainly for its capabilities. It comes with a 4k UHD 10-bit IPS panel with Quantum Dot Technology. This innovation means the screen is capable of a brighter output, better color accuracy, and a wider color gamut. Since the screen has a 10-bit panel, it has 1024 shades of each primary color so, in theory, it can produce its advertised 1.07 billion colors. Added to that is that it has a 14-bit lookup table (LUT) providing it with an even wider gamut to help with color recalculation and gamma correction. Without this, the product will not be able to represent the little difference between color shades leading to inaccurate color reproduction. Despite these positive points, the product suffers from brightness uniformity. This con is an unfortunate characteristic most Asus monitors share.But by using the Uniformity Compensation option, this can be corrected. As with the other presets, this will lock the brightness to a fixed level. The size and the resolution of the PA329Q also ensure that the picture does not look grainy or edgy and the pixels are nearly invisible. Coupled with the matte anti-glare, this will prevent strain on the eyes from extended usage even if the monitor is to be used in a well-lit environment. They also provide a larger canvas or workspace most useful for design programs with crowded interfaces or large format images. All of these come together to complement the capabilities built into this product. The PA329Q comes equipped with a variety of features in the SPLENDID section of the OSD to match the hardware. It has eight picture modes within, including Adobe RGB, sRGB, and Darkroom Mode. There are also presets for reading, still imagery (Scenery mode) and a standard mode for regular use. Using Adobe RGB and sRGB locks the screen into a preset and prevents adjustment of the calibration settings such as gamma correction and brightness. Darkroom mode should be selected to allow full calibration. Additionally, the calibration application mentioned before supports i1DisplayPro and Spyder5 adjustment. 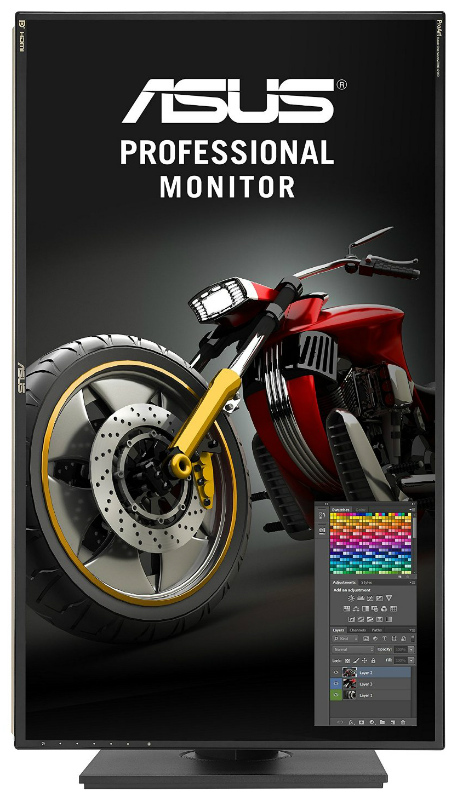 This addition allows advanced and sophisticated adjustment of the color output and potential of this monitor. Although most notably, the PA329Q achieves 99 to 100% coverage of the Adobe RGB, sRGB, and NTSC spectrums. This result is excellent since most professionals will work on these two presets. If however, certain issues arise such as colors being too warm or grayscale is lacking in depth, I would advise the user to select Darkroom mode and calibrate according to preference. There are adjustments for color warmth, blue filters and an advanced settings menu which opens the six-axis selector for hue and saturation. Another convenient option is to turn on VividPixel which increases the contrast between objects in the image. There are also other features that make use of the additional connectivity options and ample screen space. The OSD features an option to enable PIP mode (Picture in picture) with up to four additional sources. This feature is ideally suited to the other signal inputs included. Another notable feature is the Quickfit option. When activated, this will place actual paper size templates on the screen for easy matching of the user’s work to a medium. Since the professional monitor market consists of discerning and advanced professionals, this niche does not leave a lot of room for error for the manufacturers. With that in mind, most of the monitors competing in this segment are either tied or have minor differences. For the steep price, the Asus ProArt PA329Q does not disappoint. It has the performance and the hardware to justify the price tag. The inclusion of the Adobe RGB and sRGB presets makes this an excellent choice for professionals. On the other hand, that addition also brings a slight downside to the product. For some, the inability to adjust other settings while on these two presets could be a deciding factor. In a world of professionals and enthusiasts, if there is something that prevents tweaking or experimentation for something so important as these presets, this factor could weigh down heavily on the decision of getting the PA329Q.